I've got a good mind to kill you myself right now. 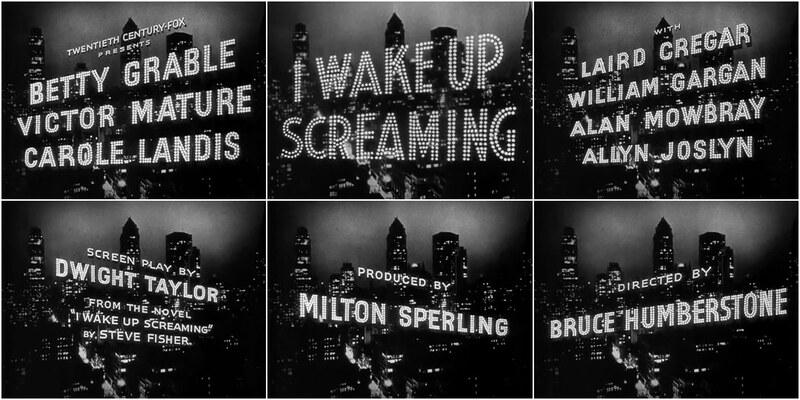 In the opening title sequence to 1941's I Wake Up Screaming, the credits are spelled out in lights superimposed over the New York City skyline. 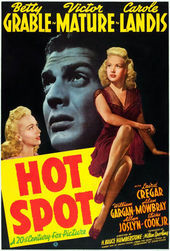 Originally titled Hot Spot, the film is a noir based on the novel I Wake Up Screaming written by pulp author Steve Fisher. In 1953, the film was remade as Vicki. The score to the film is a strange beast, featuring the song "Over the Rainbow" from The Wizard of Oz throughout, as well as the theme from the 1931 film Street Scene. The title sequence is a kind of preface to the graphic matching of Hitchcock's North by Northwest. The technique can also be seen in the 1936 film My Man Godfrey, which handles the technique robustly, placing typography in the milieu of buildings and giving it reflections. A modern equivalent to this technique is the opening title sequence to David Fincher's Panic Room, featuring glossy three-dimensional typography placed directly among the buildings, skewing and slanting anew. Notably, each of these films takes place in New York City, the opening serving to ground their stories in this electric, dense, and structured urban centre.